The fourth edition of the International Music Competition ‘Triumph of the Art’ is open to strings from 15 to 32 years old and will take place in the Brussels Conservatory from 19 to 24 November 2018. 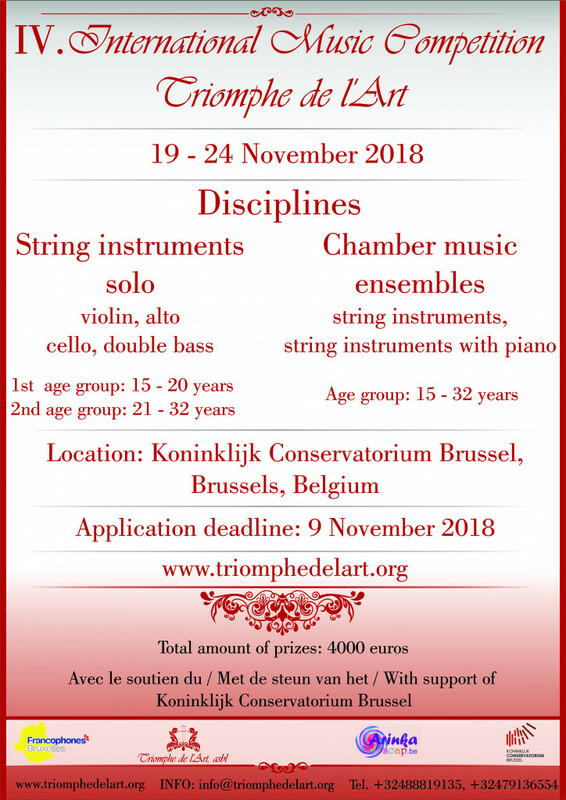 Cellists in category 1 (15-20 years old) will in the first round be able to choose between a short virtuoso composition by David Popper or François Servais. Cellists in category 2 (21-32 years old) will have to play a caprice by Servais, Franchomme or Piatti during the first round. The Servais Society awards a special prize for the best performance of a work by François Servais: 100 euros in category 1 and 150 euros in category 2. The jury can decide not to award the prize.